Me: What do you think about these leg stirrups? Doctor: So, you’re a healthcare designer… what’s the one thing you’d recommend changing in this room to help patients feel more relaxed? Besides sending these stirrups to the junk yard and replacing them with wider cushy feel good supported ones–upholstered and cushioned with the softest material imaginable–that also massage your legs while on the table…. it would definitely have to be that overhead exam room lighting. I went on to share how the overhead recessed, cool spectrum white fluorescent light fixtures not only were outdated and unattractive, they (more importantly) have been known to induce headaches, eye strain and depression. And because of the overwhelmingly negative effects this type of lighting has on human beings, cool spectrum white fluorescent tubes (and bulbs) have been banned in healthcare facilities across Germany. 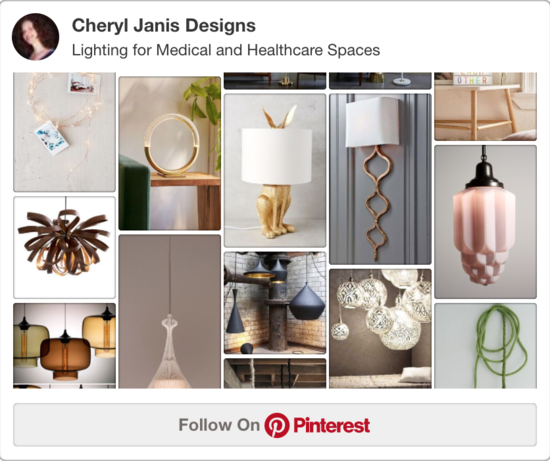 Take a close look at the lighting in your waiting room, treatment and exam rooms, and all your rooms in your healthcare space. Specifically, look at the light bulbs you are using and if they are cool spectrum tubes or compact fluorescents, remove them now, stomp on them like you would at a Jewish wedding  and send them to be recycled. Replace them with warm artificial lighting (LED’s, CFL’s or dare I sayincandescents), which has been shown by a 1992 study to foster collaboration, reduce avoidance behavior and conflict among your team members, patients and other human beings you work with. Want more lighting design inspiration now?